Another online grab of mine from years back. 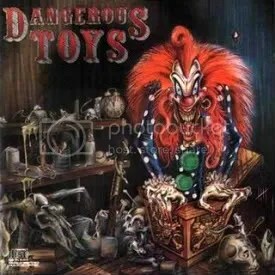 I had heard so many good things about Dangerous Toys years before even picking this up, but it was one of those albums where I kept putting it off or would find something else to order instead. Well, despite the freaky tribute to Killer Klowns from Outer Space, this is a great release and it definitely deserved the gold status it achieved. Jason McMaster sounds very much like Axl Rose at times and it’s fitting, because the Texas-based Dangerous Toys have a ‘Guns ‘N Roses or L.A. Guns meets Southern rock’ vibe going. Don’t get me wrong, this is no Appetite for Destruction, but it’s a great blend of the South, sleaze and glam. Supposedly, guitarist Danny Aaron did not play on the album and had actually left the band before recording even began. He is still credited and pictured though, so maybe Dangerous Toys knows a bit more about the situation than any gossipers would. Metal band Shadows Fall did a cover of “Teas’n, Pleas’n” for the Japanese pressing of their album The War Within.